it depends on the file size as to how long you have to wait for the next one. Topic: Issues with NSW ADSL1?!? 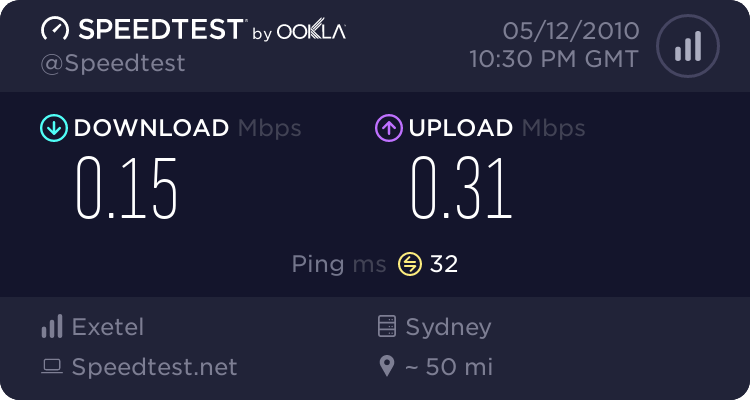 Re: Issues with NSW ADSL1?!? I'd say it was shaping seeing as 12:00pm on the dot its back to full speed. I'd say there is a problem. Well mick its been 12 days since ticket has been responded to by Exetel, so I'm hoping Tim or something is watching this topic! I started that at 2pm so you can see how it starts out then goes badly, today was actually a good day, its usually quite worse. You can only download as a free user every 1 hour, and thats the error message it will give. Will provide some new ones when problem happens again. which is most likely tonight.